Upper Deck’s Legendary: A Marvel Deck Building Game has become the company’s top gaming property with two core sets (Legendary & Villains) and three expansion sets (Dark City, Fantastic Four & Paint the Town Red) in the market. Now Upper Deck brings Marvel fans even more excitement with the fourth expansion in the series. With content dedicated exclusively to Marvel’s Guardians of the Galaxy cast of characters, comic fans have enjoyed over the years and that Marvel movie fans have come to know and love as well. Legendary fans are going to be thrilled to add their favorite Guardians of the Galaxy characters to their decks as this expansion will include 100 all new playable cards featuring original artwork. This expansion will feature the five key heroes from Marvel’s Guardians of the Galaxy (Star-Lord, Gamora, Drax the Destroyer, Groot and Rocket Raccoon) as they get help from Nova to do battle with one of the evil masterminds; The Kree Supreme Intelligence. New game mechanics, schemes and tactics will add to the gameplay and these new cards will all be playable with cards from the previously released sets! 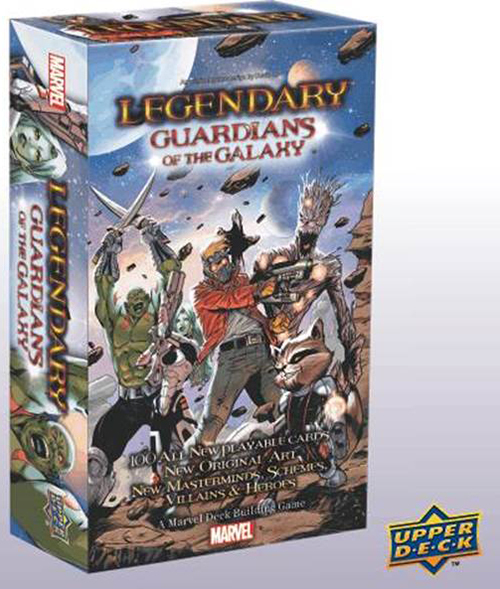 Gamers can play with or against each other in Upper Deck’s latest Legendary expansion for Guardians of the Galaxy when it releases on October 15, 2014.